Could the next Corvette feature a new kind of adjustable downforce? Our friends over at midenginecorvetteforum.com have another juicy scoop for us. This time, it's not renders or spy photos, but a patent filing. It just goes to show you how passionate the forum members are, and how excited they are for the new Corvette. This patent applies to some wild new spoiler technology. Nearly everyone knows that spoilers are a performance trade-off – they create downforce, which improves grip and handling. That improved grip comes at the expense of top speed, since the spoiler produces drag. While manually adjustable spoilers have been around for decades, the level of downforce couldn't be adjusted on the fly. The same goes for retractable spoilers – you can have all of the downforce or none of the downforce, but not some of it. GM's new patent outlines an electrically-adjustable spoiler that allows for changes in surface area. This active, adjustable spoiler will change shape on the fly to create the best balance of downforce and drag for that particular situation. The patent application, officially titled "VARIABLE-WIDTH AERODYNAMIC SPOILER ASSEMBLIES AND CONTROL LOGIC FOR MOTOR VEHICLES," is, curiously enough, submitted with patent drawings showing a front-engine, front-wheel-drive car with a transverse-mounted four-cylinder engine. It would be foolish to imagine that this is anything but a red herring, or an attempt for GM to keep additional C8 design details under wraps. John, the admin over at Mid-Engine Corvette Forum, wonders if this spoiler will make an appearance on the regular-production C8, or if it will be saved for higher-performing variants such as a possible Z06 or ZR1. He also posits that it could be used to generate yaw during cornering. 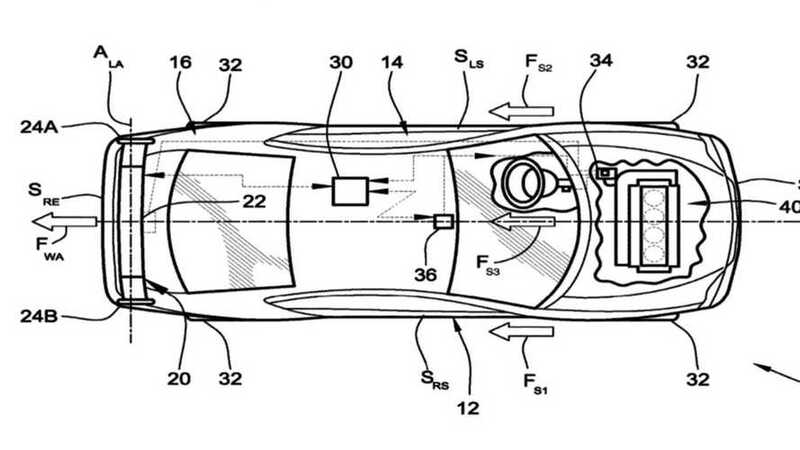 Then again, we could all be reading way too much into this, and it won't be used on the Corvette at all...but the timing of this patent application does seem suspect. Time will tell.